Some hikers suffer from a syndrome we know as dehydration. I am not referring to a lack of water but rather to the growing number of us who choose to dehydrate our food. There are many positives to this, and a few negatives as well so let’s see what the deal is. I do dehydrate my hiking food occasionally when I am of for a week or so, or a weekend but on my previous thru-hikes I haven’t. I relied on provisions I could pick up in towns along the way. My favourite staple was Knorr Rice Sides, these were popular in the supermarkets so I could usually find them, they were cheap and available in loads of flavours so when I tired of some, there were several others to choose from. Throw in the occasional Ramen and I was sorted. However, from a health point of view, I do try and watch what I eat. At home I consume little meat and dairy and concentrate on plenty of vegetables, some fruit and fish. I choose good grains – Quinoa, brown rice, millet and eat plenty of nuts. Olive, Hemp and Sesame oil provides me some excellent fats and occasionally if I need a protein blast that only a rare steak can give me, then that’s what I’ll have. My body takes hammering on a thru-hike because it is difficult to get hold of the one main meal, dinner, which is healthy. Dried foods found in the supermarkets by the big names don’t exactly come with a healthy promise; they invariably contain lots of salt and a few chemicals thrown in for taste and shelf life. Breakfast is pretty easy, either granola (if you read the ingredients) or oats provide excellent fuels and nutrients and are light weight. Oats, in particular, are an excellent breakfast, they have a low GI Index (around 51) meaning your body will digest these foods slowly leaving you feeling full for longer and allowing you to eat less calories without feeling hungry. Dinner is the one mail that can provide a lot of calories, it is the one source of food that we all look forward to because we have finished hiking for the day, are relaxing as we watch our meal cook with lips licked, we are at our most hungry and desperately yearn for a nutritious, filling and tasty pot of goo. Thru-hikers often complain about their diet on trail. Not many of them bother with food drops because it’s a lot of organisation so we depend on what we can pick up on town. However, dehydrating your own trail food can provide us with a lot of positives, there is certainly more to be gained from dehydrating than not. You are restricted to having to stop on a particular day (when you intend to run out of supplies), or to make it before the Post Office closes. Trail food can be restricted in choice, but that doesn’t mean that you have to eat poorly. There are a few main points I like to consider when planning for a hike, be it for a few nights or a few months. They are in no certain order. For instance cost would not be as much of an issue for a weekend hike as it would be for a large thru hike and weight depends on how much you have to carry and for how many miles you have to carry it for. Each of these categories can be divided further and again depend on the type of trip you intend to do. When I have the option I personally prefer to dehydrate my food and make my meals from singular components. This is not the easiest way to prepare and can be time consuming but at the same time it is easier to tailor your meals to your own needs. There are many companies that offer ‘Backpacker’ style meals ranging from wet meals in foil pouches to freeze dried meals in foil bags, and from fairly tasty to indigestible slop you would question the ethics of feeding to a starving dog! Freeze dried meals are expensive and the portions too small for my needs, if an evening meal of approximately 500 calories is enough for you then these portions may be fine. I try and get 1500 calories fitted into an evening meal, not only would that be too much bulk in the form of freeze dried meals but I would be looking at a £15 bill for each dinner. On the other hand they are ready prepared, ready packed, have a quick cooking time, are the lightest weight option and are generally fool proof. Wet meals can be tasty, very high in calories and also cook quickly but they are very heavy and again come in small portions. MRE’s (Meals Read to Eat) along with some of the military ration packs are filling and not too outrageous in price but they weigh a hefty amount that is shed very quickly the morning after consumption! Both of the above are a hit and miss choice unless you have prior experience with the brands and their meals. I walked with Nick and his mate Chris Read for the last few weeks of my Pacific Crest Trail thru-hike. He holds a healthy interest in food and nutrition and his knowledge of this area is well honed. Whilst I was walking around the supermarket with them both for a weekly food shop and flicking 4 different types of Rice Sides into my basket, Nick and Chris would wander off to the ‘Tubes Section’, as I called it. The Tube Section, a rare find in supermarkets but always welcome, consisted of numerous upright, plastic tubes filled with everything from rice to plain chocolate covered almonds, all there to be dispensed in exactly the quantity we required. Nick and Chris would stand there, scratching chins whilst they quickly formulated a meal plan for the week based on what the tubes were offering. Once decided, Nick would bag up some rice or couscous and Chris would disappear off to the spice aisle to top up on some cumin, grab some bay leaves or supplement the garlic powder Nalgene. By creating my own meals I find that not only can I adjust my food for each trip but I can also strike the happy medium in all areas and carefully control exactly what goes into them. 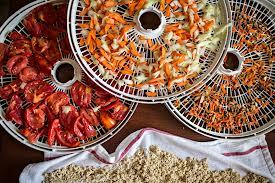 Dehydrating food is not as technical as you’d think! With a warm air current, this can be done adequately in any fan assisted oven or for around £100 you can purchase a countertop dehydrator which will give you better results with greater ease. The two main categories here are: Raw dehydrated meals and cooked dehydrated meals. The difference is a ‘Raw meal’ contains food that will need cooking whereas a ‘Cooked meal’ has already been cooked, then dehydrated and simply needs rehydrating. I generally tend to pack raw meals as I find that most of the time they tick all of my boxes. Cooked meals can be less fuss on trail but they do not necessarily have less cooking time and do have more pre trip preparation time. A Cooked dehydrated meal is exactly that, you cook a fairly dry meal and then dehydrate it…….and then rehydrate it at camp! I make the raw meals from base components that are often already cooked i.e. instant potato, minute rice, polenta, rice noodles etc. 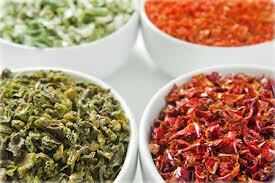 To these I add my own dehydrated ingredients such as tomatoes, meat, chillies, onions, garlic, spinach etc. Anything can be dried with varying degrees of use. With trial and error I have come to find what is best for me. When drying food it is wise to keep in mind several factors. Foods that contain a lot of sugar will inevitably become sweeter as the flavour of dried foods is condensed (i.e. 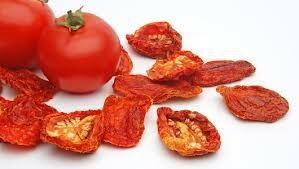 sun dried tomatoes). Some foods rehydrate faster than others, nobody wants a nice curry with chunks of leathery pumpkin in it; this dictates how you cook your food and how you prepare your dried ingredients. I find that vegetables and meats that dry tough take longer to rehydrate so I now slice them very thinly if I have to keep cooking time/fuel consumption to the minimum. I shave vegetables like Carrots and Parsnips, for drying meat I partially freeze the meat before I slice it allowing me to cut extremely thinly before it is prepared for drying. Pumpkin, Squash and turnip must be finely diced or sliced, they can be pre-cooked, mashed then dehydrated and blended to a powder as with tomato puree or pasta sauce (these also makes a great base for soup if a lighter trail meal is required). There is a bit of experimentation needed for drying mash, when rehydrated it can become very gelatinous and often requires powdered milk/cheese or sour cream. Texture must be considered as getting carried away with cutting cooking times can result in every meal ending up with the consistency of semolina due to all the ingredients being uniform in size. If I know I will be cooking on an open fire and have the luxury of time then my meal will have a greater cooking time, this allows more of a variety of meals, longer boil times mean I can use cubed vegetables instead of sliced, it cuts down on pre-trip preparation and keeps the cost to a minimum. If I am likely to be cooking at 12000ft at 8:00pm after a long day in the rain and I’m using a bivvy, then I will want to keep cooking time as short and sweet as possible. Curry Powder, flaked chilli, five spice etc. I can cook a large meal like this in under 10 mins for one person on 1 fl oz of alcohol or two people on 1.5 fl oz of alcohol. Dried Parmesan cheese to top off! This meal has to be packed in two bags as the Barley and spelt will need to boil and then simmer for 30 minutes before adding the other ingredients. I will carry lighter food for longer distances, higher fat content for colder weather, higher salt content for warmer weather and if I can resupply in the next two or three days I may well even take out a chunk of steak and some fresh veg! Whatever suits. True enough, sometimes I won’t but as Nick says, depending on the conditions we either go for something quick or if we have favourable conditions and don’t mind taking the time, we spend a little longer. I enjoy cooking so it doesn’t bother me. The ingredients list Nick has given us seems long but are still less than you would find in most dried meals, and don’t contain any chemicals. However, there is a lot of them and this means work. It would be time consuming and uneconomical to source all these ingredients and then dry enough for a weekends worth of food. If you do decide to go down the route of drying and preparing your own trail meals, or at least some of them you will have the luxury to dry a lot more than you need of various ‘staples’ such as rice, meats, vegetables and then store them. When your next hike comes around, all you need do is to take a little of each and bag it up. A little work at first for sure but saves you time later and you have tasty meals tailored to exactly how you want them. 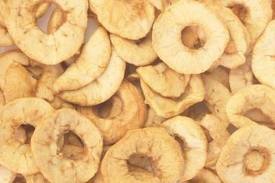 Dried or partially dehydrated fruit is much more readily available than dried vegetables. I have noticed in the States, as opposed to the UK, that I had no problem obtaining a good selection of these to take on trail. Apples, prunes and mixed fruits could always be relied on in the supermarkets. Fruit is one of the greatest rewards dehydrating has to offer as you can cut the weight of your fruit by as much as 85%. I use fruit, seeds and nuts as my main calorie intake for the days hiking. I add dehydrated fruit to my morning porridge and snack on it throughout the day, bananas, pineapple, kiwis and strawberries keep my huger at bay. For a typical lunch I have a tortilla with canned fish, crushed crisps, dehydrated spinach, onions, herbs and spices. This summer I shall be taking out my new pesto recipe: dried ingredients with a touch of water added in the morning and a spoon full of olive oil added before mixing at lunch. Fruit and vegetable leather is a nutritious, chewy and tasty snack. Mango, banana and tomato are my favourite. 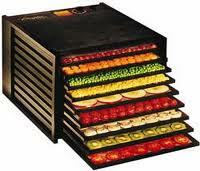 It is easy to make, blend the fruit/veg and dry on screens in a dehydrator or on a silicone baking sheet in the oven. Slightly roasted, Sprinkled with Soy and dehydrated vegetables such as Broccoli, cooked Beetroot and Cauliflower make a nice daytime savoury snack. Vegetables can be dried to a pliable state so they are not fragile to pack. Many of the ingredients for these meals can be purchased dry and this can make for a better meal. With a little research it is possible to find quick-cook grains and pulses such as Spelt and Brown rice or instant Sweet potato mash. This makes a large difference on cooking time when used for the main body of a meal. They take a lot of work out of the equation, provide greater variety and may work out more cost effective. Some foods are easier to dry than others. For example Mushrooms, Bok Choy, nettles and Cabbage dry quickly but puree’s, mashed veg and cheese can be a bit more tricky and instant mash potato is so easy to get hold of and fairly inexpensive it makes little sense to bother making your own. Other ingredients are only available at a substandard quality, are fiendishly expensive or very hard to find such as Nettles. There is little work in popping out for a quick stroll and coming back with a bag full of fresh Stingers that will dry in a few hours, be the base for a great ‘Trail Sag Curry’ and keep you fighting fit as you march on. Dried Black berries are like black pearls of delight in your breakfast and Wild Garlic makes a great quick drying Leek like green for multiple uses. Because of the long life of dried foods you can ‘make hay while the sun shines’ and dry Damsons when the branches droop. When things come into season I pick and dry wherever possible. Meat is another area where you can save money and enhance flavour. The easiest are the ‘Jerky’ type and dehydrating cooked minced beef; both have a relatively good resupply box/shelf life if properly packaged. The recipes for these are easy to find online along with a wealth of information on home food dehydration and dehydrators. Meats usually require spicing/curing or marinating prior to dehydration and some meat types as with mince are best pre-cooked. It is possible to dehydrate fish, poultry and game but they are more complicated and can be a health risk if not well prepared and well stored, be wary of information that does not come with a considerable amount of health and hygiene advice when drying and storing these meats! I use two dehydrators, one I purchased ten years ago in Canada for around $80 (Salton Home Dehydrator) which has rather fragile trays that are quite hard to clean and have become cracked in the process, it does the job though. The other I purchased at a flea market in Switzerland last summer, a bargain at 80CHF. A Stockli Dorrex dehydrator with metal mesh screens that are far more durable and much easier to maintain. They can be purchased in the UK for a little over £100. If you don’t want to invest in a dehydrator then you can use your oven. Buying a cheap one to try is false economy – it invariably won’t be any good and you’ll end buying a more expensive one to suit your needs. Better try with your own oven. It’s straight forward, turn to the lowest setting that’s available and leave the door partially open as narrow as possible. Remember, it’s not just about heat but air flow as well. I usually jam an item of cutlery in the door to keep it ajar. I have dried successfully in the airing cupboard as well (I’m not sure if my friends over the pond call it this but it’s essentially the cupboard where the water boiler sits). A mesh or rack is preferable as the heat and air can reach the underside of the food also, and the moisture is driven away far more easily. You can dry on a solid metal tray but moisture tends to accumulate around the food. Mesh can be found at some garden centres, make sure you get the finest you can see, think of your mesh sieve in the kitchen and you get the picture. Construct a square frame from 4 pieces of wood, say 1” x 1/4”, drill some pilot holes in the end (prevents the wood splitting when you insert the screws), and simply put a couple of screws to make a square frame. You can tailor this to the size of your oven shelf. Then, stretch the mesh over the frame and staple into place, you’ll need a few to make a nice, taught surface. There’s no fire or melting risk as the temperature is minimal. Try some easy ingredients first; spinach, nettles, onion, garlic and mushrooms all dehydrate well. Slice thinly, get as many on the mesh as you can but not touching and put on the top shelf of the oven. It may well take a day to dry them completely and I’ve found the best way to test when this is, is to get them as near to ‘snappable; as possible. It takes a little practice but you’ll get there. It is also worth buying some moisture sachets or oxygen absorbers to put into the containers / bags where you eventually store your dried foods. These such up any moisture, will help prolong the shelf life and inhibit any moulds etc. that may thrive on any moisture left.